A visit to Galway city is a must if you are coming to the west of Ireland and can be arranged with Connemara Coastal Tours. Known as the 'City of the Tribes', Galway is a vibrant city full of culture and life. To find out more about the city go to www.galwaytourism.ie. The picturesque town of Westport is situated in the shadow of Croagh Patrick, overlooking Clew Bay. This unique and charming town boasts many tourist facilities. Croagh Patrick is one of Europe's best known places of pilgrimage.Climbers will find a small church at the summit and magnificent views of Clew Bay. Set at the head of Clifden Bay and in front of the Twelve Bens, Clifden affords some spectacular views. The town was founded in 1812 and is dominated by two beautiful churches. Here you will find many restaurants, bars and shops, and annual attractions include the Connemara Pony Show in August and Clifden Arts Week in September. Roundstone is a busy Connemara village popular for it's clean, beautiful beaches. It is one of the oldest fishing villages in Connemara. The main street overlooks the pretty stone harbour and you can sample locally caught seafood in the local pubs and restaurants. Roundstone Music and Craft Shop is where Malachy Kearns, better known as Malachy Bodhrán amongst folk musicians, works at his craft of making Ireland's oldest product - the Bodhrán. Regular talks and demonstrations are given about this famous instrument. Ballyconneely is located on a peninsula with spectacular scenery overlooking the Atlantic Ocean. The area has some of the most beautiful beaches to be found in Ireland and is also home to the Connemara Links Golf Course. Claddaghduff is a short distance from Cleggan village and is probably best known for its many sandy beaches, particularly Omey strand, which separates Omey Island from the mainland. The island can be accessed by foot or car at low tide. Enjoy the annual Omey horse races which are held the strand each summer. Cleggan is a picturesque fishing village situated 10 km northwest of Clifden, at the head of Cleggan Bay . A focal point of the village is the pier, built by Alexander Nimmo in 1822 and extended in 1908. Ferries leave the pier daily for the island of Inishbofin, and there is also a ferry to Inishturk. Near the village is a collection of prehistoric monuments including tombs, standing stones and walls. Letterfrack is a small village located 13km from Clifden directly adjacent to Connemara National Park. The village is home to the renowned Letterfrack Furniture College, which has over 160 full-time students and a furniture and conservation workshop. Ireland's award winning radio station Connemara Community Radio has it's base here, and in nearby Derryinver you will find Oceans Alive, a sealife centre where you can take a leisure or angling cruise on a glass-bottomed boat. The Renvyle Peninsula is well worth a visit for it's stunning scenery, charming villages and beautiful beaches. Connemara Mussel Festival is held here on the May bank holiday weekend each year. The festival is a celebration of the locally produced Killary Mussels, and includes cookery competitions, music and craic. Leenane overlooks magnificient Killary Harbour, Ireland's only fjord. You can enjoy a cruise on Killary Harbour in The Connemara Lady, an all-weather catamaran. Close by are the beautiful Ashleigh Falls, the Eriff and Delphi rivers, famous for salmon and sea trout, and the majestic Mweelrea, which stands at 2,688 foot. 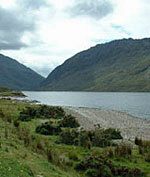 The film "The Field" starring Richard Harris was filmed in Leenane. The "Quiet Man Cottage Museum" is a must for any Quiet Man enthusiasts, or even those wishing to visit a typical Irish cottage of the 1920's. John Ford's movie "The Quiet Man" starring John Wayne and Maureen O'Hara was made here, with filming being centred in the village of Cong on the Mayo-Galway border. Ashford Castle is located in Cong. This luxury 5 star Castle Hotel is one of Ireland's most magnificent castles and one of the most luxurious resort hotels in the world. Inishbofin, Inishturk and Clare Island are among the islands you can visit off the coast of Connemara and Mayo and all three can be reached by ferry. Inishbofin is home to ancient forts and monastic ruins, while Clare Island is a walkers and divers paradise and once home to pirate queen Granuaile. Inishturk has breathtaking cliffs and numerous archaeological sites and also excellent walking and diving. Macdaras Island is 7 miles out in the Atlantic and is uninhabited - a special place. In Galway Bay, the three Aran Islands are some of Irelands most famous and a haven of traditional language and culture.